1981 - Tony Giancola. Photo: unknown. 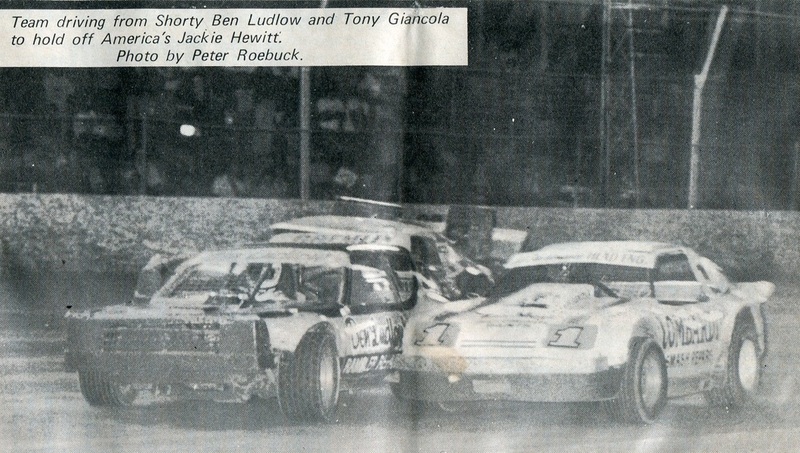 1981 - Big Ed Wilbur barging through under Ben Ludlow. Photo: Bruce Hunt. 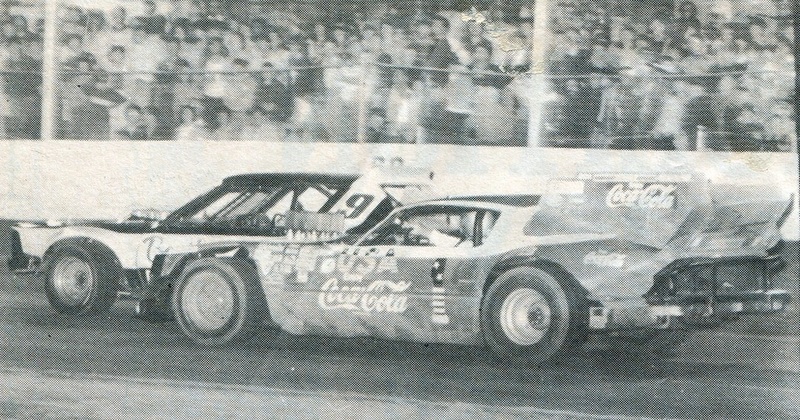 1981 - Jack Hewitt and Johnny Pearson from the USA. Photo: Peter Roebuck. 1982 - Craig Vosbergen - unknown - Andrew Gifford. Photo: unknown. Craig Vosbergen Mini Modified Junior Sedan. Photo: unknown. 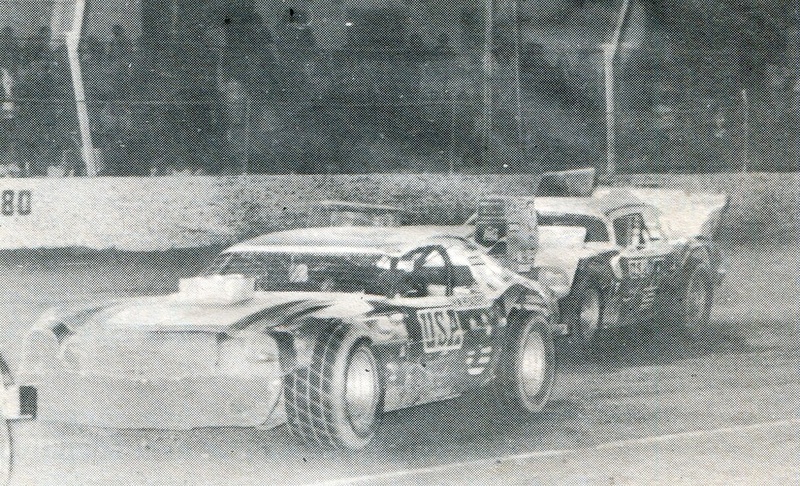 Allan Baker recalls: Back in the days when I had half a brain, intelligence, drive, enthusiasm and no idea, I used to leave home early on Saturday morning before daylight, That was after a very late Friday at Claremont Speedway. I began this radio program in 1982, a while later I was joined by Ken Brown and John Cardy and finally Frank Hastings. During the life of the program we dragged many competitors out of bed to join us in the Curtin Uni studio's at ungodly times, At one point we even linked to2BCR-FM in Sydney and had competitors in conversation coast to coast. Half way through the life of the show, I left to concentrate on family issues, The program featured the best of the best in motorsport. My favourite interview was my telephone hook up with my racing hero, the King of Stock Car Racing. 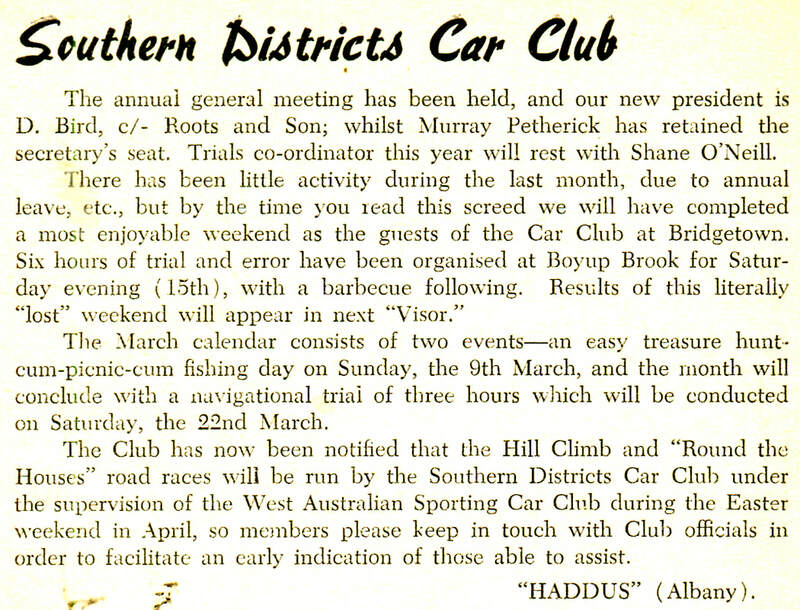 The great Richard Petty had granted us (free of charge) a half hour interview, Off track interviews by some drivers came at a cost (hence not to many Touring car champions, One exception the late Peter Brock who I interviewed at Wanneroo Raceway, he even locked the door of the transporter so we wouldn't be disturbed, The program lasted with Hastings and Cardy at the helm until the late 1990's. 1985 - Jerry Nixon. Chevrolet Monza. Photo: unknown. 1985 - 1st Ian (Bonza) Bradford 2nd Ron Krikke the Bunbury Bullet and third John Krikke. Photo: Peter Roebuck. Claremont Speedway the longest continuing running speedway in the world hosted the 1984 - 1985 Australian Sprintcar Championship on the 12th of January 1985 at the showground track. 1985 - Kevin Strange 10 - Kinnear 46 - John Walsh 75. Photo: unknown. 1995 - This Peter Roebuck pic captures the moment when Ron the winner and Lee Foster runner up step from there cars after the feature, Behind the boys is Doug MacPherson, Rons engine man, The story behind the story is Rons engine was well past its use by date and had to be patched up prior to the feature, Doug performed that job and Ron nursed that power plant through to the win. Photo: Peter Roebuck. 1995 - Ron Krikke Australia 1 in the Bunbury Toyota Throstle car. Photos: Peter Roebuck. 1985 - Ron Krikke had won the Australian Sprintcar Championship in the Throstle car owned by his brother Peter Krikke from Bunbury Toyota, The problem was that this car was out of date and had an ailing engine programme, so with that Ron moved to a new team made up of a young engine man by the name of Geoff Kendrick and a local chassis builder in Geoff Murphy, Bill Nitskie who owned Action Performance came on board to help out with some funding for the team. Photo: Peter Roebuck.